The food processing industry demands ahighly regulated production environment. Hygiene and maintenance is an absolute priority and is firmly implemented. 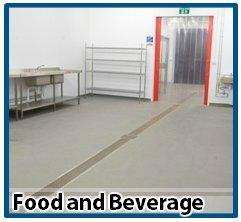 Food production spaces need a flooring system that is durable, safe (non-slip), resistant to chemical substances (acids, wines, liquids, oils, blood, base chemicals, etc. ), low maintenance (easy to clean) and prevent bacterial growth. High Performance Solutions, Inc. (HPS) is a top-quality flooring systems provider with years of experience working with the food and beverage industry. We understand and comply with the guidelines for construction of floors in the food production industry and ensure that our products satisfy the food & drink manufacturing’s operational requirements.